Laying Down the Law, has everything you need for your next celebration. This assortment features World Class & Cutting Edge products and includes: 25 multi-shot repeaters, 12 reloadable shells, and 5 saturn missile batteries! Spirit of America is a 200-gram repeater assortment with 12 quality items, offering incredible variety and performance at a great price. 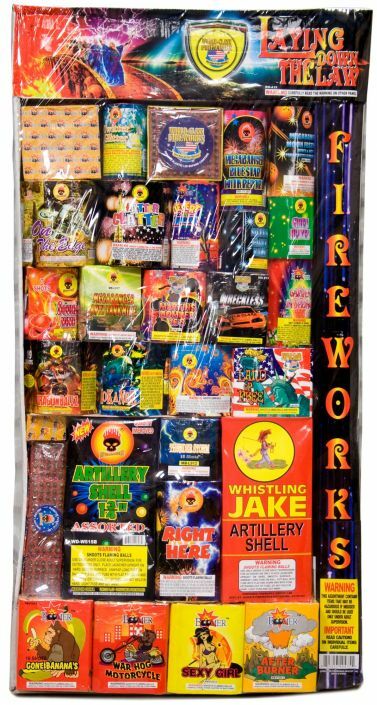 A full lineup of product to entertain the whole family, from novelties and fountains, to repeaters, artillery shells, and tubes! A large assortment of 18 200-gram repeaters, plus a small Mini Magnum Artillery kit. And of course Excalibur, our best-selling shell kit ever. Note that this version of Excalibur has fiberglass tubes rather than the HDPE that's included in the standalone version.